Drs. 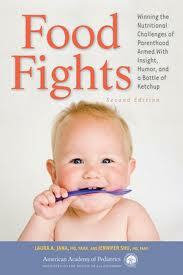 Laura Jana and Jennifer Shu, who also wrote "Heading Home with Your Newborn"), continue to bring “peas and harmony” to family meals with practical advice gleaned from their experience both as pediatricians and as moms in their new book, Food Fights, 2nd Edition. ▪ Sick kids, vitamins, body weight, allergies, constipation, spitting up…and so much more! This revised second edition also includes new chapters on healthy breakfasts, what's lacking in snacking, and supermarket sanity, and serves up important guidance on making sense of package labels and choosing foods wisely. Add the cornucopia of resources such as recipes for success, a nutrient primer, and phone apps that help families stay on a tech-savvy track to good nutrition and this new and improved edition of Food Fights is guaranteed to leave you satisfied. This book was written so well and was so easy to read! They pretty much cover any questions you have about food, eating, drinking, and even illnesses that you would have with your children from birth to teen years! My favorite chapters were the chapters that covered Breastfeeding, Feeding Through Sick and Slim, and the 5-Second Rule! They were very interesting and informative! This book was really easy to read. They wrote like they were just talking to us and the bold words and extra info boxes throughout the book were really helpful and informative and helped break up the book into easy to read sections! As pediatricians and moms, Drs Jana and Shu know that it's important to focus on good nutrition, but also to pick your battles. Food Fights offers reassuring and practical advice for parents who are worried about whether their kids are eating too much, not enough, or nothing green.